WATCH: @andrew_pozzi sends British crowd into a delighted frenzy as he takes 60m hurdles #IAAFworlds gold. A quote from the late, great Roger Bannister helped turn Andrew Pozzi from prey into predator as the British sprint hurdler hunted down a U.S rival to play a real captain's innings for the home team at the world indoor championships on Sunday. The 25-year-old Pozzi has long seemed to have the talent to graduate into hurdling's elite but, with nagging injury woes dogging his progress, he had begun to look like easy meat for transatlantic rivals like Jarret Eaton. Yet after reading a quote from the British athletics hero Bannister, whose death at 88 was announced on Sunday, the British team's co-captain reckoned he went to the Arena Birmingham track with new resolve. "Roger Bannister was an unbelievable athlete and unbelievable person," Pozzi said. "I'm very sorry that he has left us but I read one of his quotes today about a gazelle before heading down to the track. It said 'Every morning in Africa, a gazelle wakes up and it knows it must move faster than the lion or it will not survive'." This time Pozzi was the survivor. After looking superb in his semi-final, he clattered into the second hurdle of the final and looked to be struggling to battle into the medal picture as American fast starter Eaton seemed to be in control. Yet surging back over the second half of the race, Pozzi ended up dipping simultaneously at the line and the pair stood side-by-side looking up at the big screen until it was confirmed Pozzi had prevailed by 0.01 seconds in a time of 7.46. "My heart stopped at the end there," Pozzi said. "I knew I was behind at the fifth hurdle but I can't describe how much I wanted it. I was throwing my body at the line." 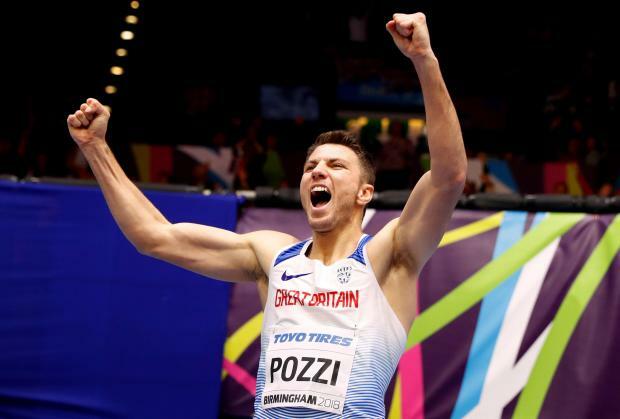 It was a fitting venue for Pozzi to finally come of age after narrowly missing a podium spot at both the 2014 and 2016 editions of the world indoors. The Stratford-upon-Avon hurdler had first watched athletics in this very Arena Birmingham venue 15 years ago and reckoned he could not have had a better setting for his big breakthrough. "To be a world champion in Birmingham makes the achievement tenfold. I've grown up here, especially at this venue, over the last decade," he said. "A moment like this has kept me going through all of the injuries. I knew I could come back and get to the very top. "These championships have been amazing and to be the British captain is the biggest honour of my life. Now, to win as well is an absolute delight." Andrew Pozzi celebrates his victory at the world indoors in Birmingham.